Every profession has its fashions and fads. A few years ago chefs began to talk about fusion foods, the mixing of different cuisines and ingredients, as if they were the latest culinary invention. In fact, since mankind started travelling, there has always been fusion food. This is why a recipe or a dish we instinctively think of as ‘ours’ more than likely exists not just in neighbouring countries, but also on the other side of the world! 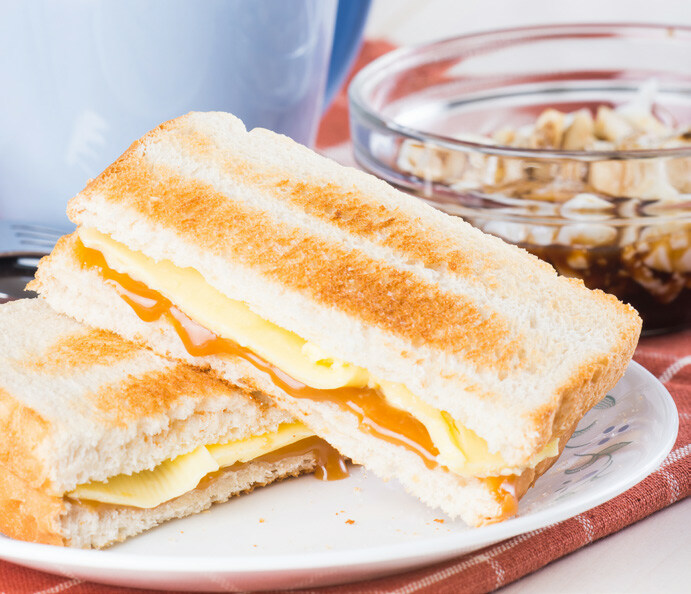 A great example of this is the simple British habit of toast for breakfast being taken and combined with a delicious local spread to create kaya toast, a favourite breakfast in Singapore and Malaysia. kaya is a local spread made from eggs, sugar and coconut milk, sometimes flavoured with the leaves of the tropical pandan plant. It has a smooth creamy texture not unlike lemon curd, although its taste is of coconut. From the 13th century, Chinese sailors had been passing westwards through the Straits of Malacca to India and beyond, but from the 16th century onwards, boats from European countries also began to travel to the East. In 1819, the British East India Company established a trading post on an island at the tip of a peninsula that separates the Indian Ocean from the South China Sea. The peninsular would later become part of Malaysia and the trading post would grow into the most important port and commercial centre in South-East Asia with the name of Singapore (from the Sanskrit Singapura, Lion City). The name ‘kaya’ was probably given by the Malays who refer to it as Seri Kaya. Kaya in Malay means rich, and is probably a reference to the extremely rich texture of the product. A community of Malays known as the Nonya, who use a lot of pandan leaves in their cuisine, later added pandan as an ingredient in kaya. Today there are commonly two basic versions of kaya to be found; one made with pandan leaves which give a greenish colour and a slightly nutty flavour, and one without, which has a more orangey-brown colour. Kaya can be prepared at home and many people still do so, but it is quite a time-consuming process involving lots of stirring, ideally using a bain-marie to prevent the eggs from curdling. Now it is also sold commercially in jars, often with new slants to the original recipe. Today, whether you find yourself in Kuala Lumpur or Singapore, there are two typical breakfasts, both with kaya as its heart. Whichever version you choose, it will probably be eaten standing up in a café near where you live, work or are staying. 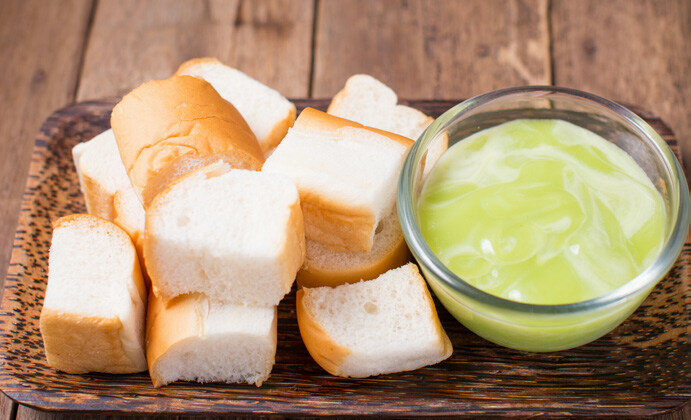 The simple version is a hot toast sandwich, spread with kaya and cold pats of butter. According to the café, thicker or thinner slices of bread will be used, but in either case, as in the tea-time sandwiches served in 18th century England, it is customary to cut off the hard crusts. Traditionally, the toast was prepared over charcoal but these days, quicker toasters or ovens are usually used for busy customers. The ‘fuller’ version is soft-boiled or poached eggs, seasoned with pepper or soy sauce, toast and a dollop of kaya on the side of the plate. The favourite breakfast drink is coffee, although some prefer tea, whilst others opt for cham, a mixture of tea and coffee with a frothy top, a sort of local version of cappuccino. ** If using instant yeast: divide the amount by three. Make up Make medium long. Let the dough rest for 10 min. Make long (± 30 cm) and wind around your hand. Squeeze the dough ends together and roll a bit on the table. Final fermentation ± 45 min. at 28°C and 80% R.H. Store at 5°C until the next morning. Let the bagels warm up for 30 min. at 28°C and 80% R.H.
Oven temperature Roll in oven ± 280°C until 220°C. 4 L steam after 2 min. Open the door for 10 sec. and the damper during 2 min. Cut the bagel in half. Pipe the Deli Kaya* as shown. Caramelise and decorate with the little leaves. Deli Kaya is the perfect product to allow you to make your favourite traditional kaya recipes without any constraints.